SKU: 3334. Categories: Shop All ThinLine Products, Western Saddle Pads, Western Correction saddle pad, Western Horse Tack, Therapeutic Saddle Fitting Pads. Tags: barrel pad, black western pad, rounded skirt, sheepskin saddle pad, western reining pad, Western Square. 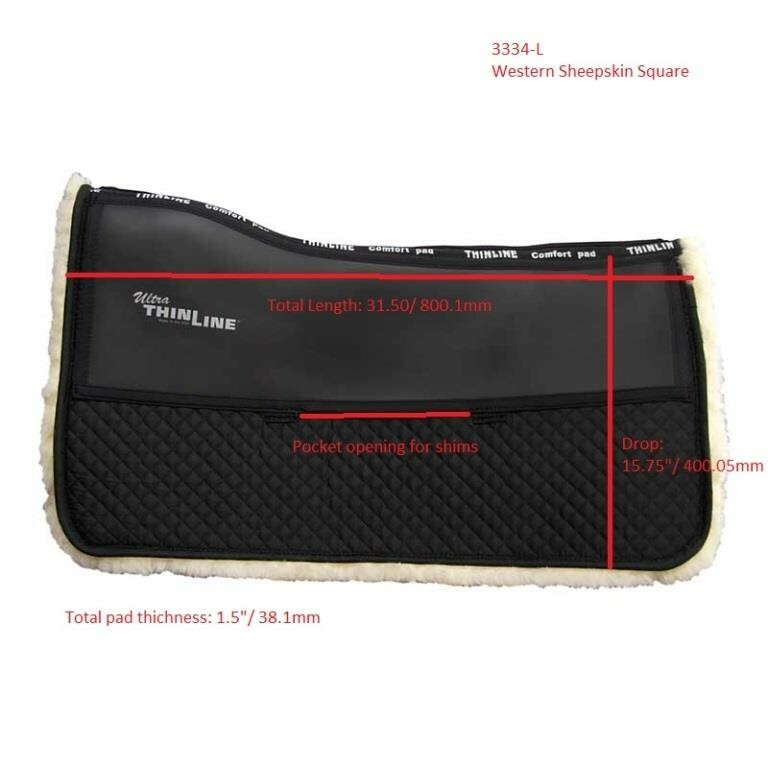 ThinLine delivers protection for both horses and riders. The only product endorsed by surgeons, master saddlers & veterinarians. What makes ThinLine so different? “The manner in which this product absorbs motion encourages horses to lift their backs, developing strength and top-line. It has been endorsed by Veterinarians, for horses, as well as Spinal Surgeons for riders. It is a top pick for Master Saddlers around the world. Equine Chiropractors and Massage Therapists carry it on their trucks to keep horses going strong, supple and relaxed. Trainers and riders find it a trusted product to improve rider equitation. It is the dual benefits of extraordinary shock absorption and rider motion reduction that sets ThinLine apart from other saddle pads. You will see and feel an increased performance in how horses lift their backs with this Western sheepskin saddle pad. ThinLine gives you an amazing seat and super shock absorption without losing the feel. Riders will sit closer, quieter, and horses will move with a much more relaxed back. 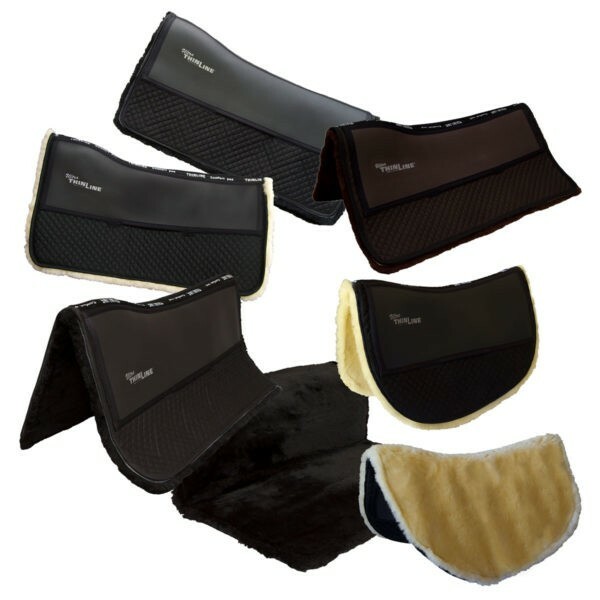 Breathable ThinLine technology helps to keep this comfort saddle pad cool under your saddle. A pocket for shims allows you to fine-tune your saddle fit. ThinLine is all about helping horses and rider achieve relaxation, suppleness, and communication. This is one of the finest ThinLine products we have produced. A full panel of 100% natural, medical grade sheepskin will be against your horse. Covering the sheepskin, is a high-grade quilted cotton pad with a light wool fill. The ThinLine panels sewn on top create both a spine free channel and allow optional shims (inserts) to be added for saddle fitting needs. Black with Black Sheepskin, Black with Natural Sheepskin,or Dark Brown with Brown Sheepskin. To add shims for saddle fitting purposes, click here: Western Saddle Fitting Shims/Inserts. 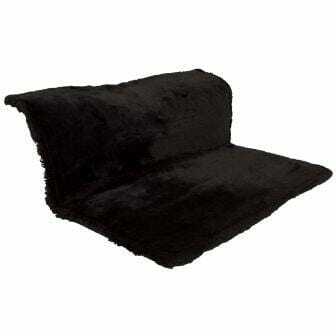 Full Sheepskin Comfort Pads are 1 1/4″ thick when fully fluffed and about 3/4″ when compressed. Excellent saddle pad. Great materials, and a great fit. I never thought i could see a horse love a product. Who knew.. Totally worth the investment. I brush it in the morning before i ride and it looks new after 6 months. Lisa Haaparanta: I have been using mine for the last few weeks on my 5 yr old mare. I absolutely LOVE it!!! She’s sensitive but is so comfortable with the pad that training is progressing quite smoothly. I’ve used it on my 10yr old AQHA mare who is arthritic through her shoulders and she is so free in the shoulders when I use it she may just be able to head back to the show pen again!! Will definitely be buying another!! 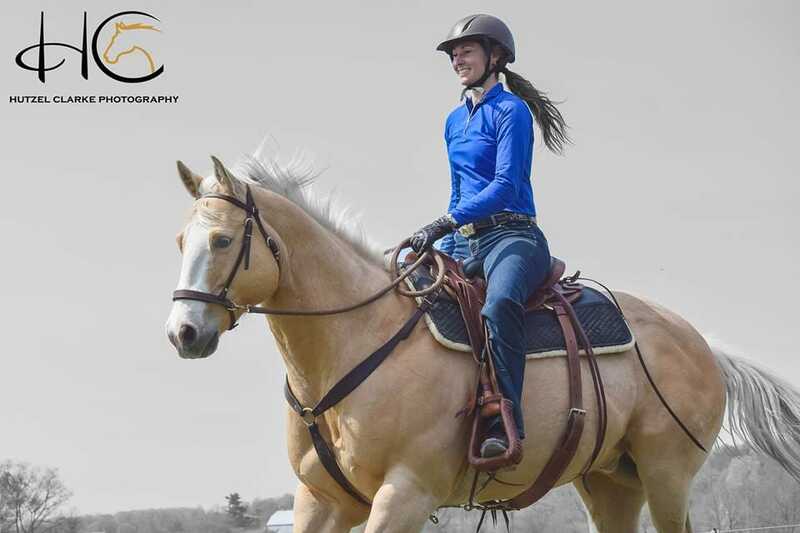 Karena Horton Crews: We bought a Thinline for our 8 year old daughter’s quarter horse. He has sensitive withers due to scar tissue from much earlier in his life. We also had a terrible issue with her saddle leaning and slipping ….nothing we tried worked. The Thinline made an immediate difference and we were able to add shims exactly where they were needed. Her Thinline made all the difference in the world for both she and her horse!!! Worth every penny! We love this pad, my horse & I! He is quieter & happier saddling up and his walk, trot , canter have all opened up. He feels freer when I ride. Thank you! Q Looking at the western square. Do you have a smaller size? My saddle is 24 inch so looking for maybe a 26 inch? A Thank you for your question! With a 28" spine length, the Full Sheepskin Pad in Medium that is currently on closeout, is going to be the closest to 26". We also have a similar 28" pad without sheepskin, the Western Cotton Liner in Medium. Q Hi, Do you make a larger size round skirt western pad, or is there only the small size that is 25" long? Thanks! A Hi and thanks for your question! This particular type of round skirt pad is offered in one size at this time. 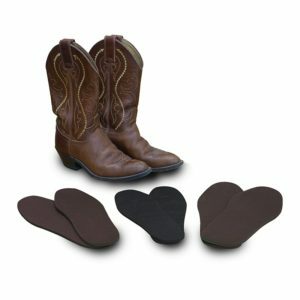 We have a few other western pads with a different style of round skirt that offer longer spine lengths. 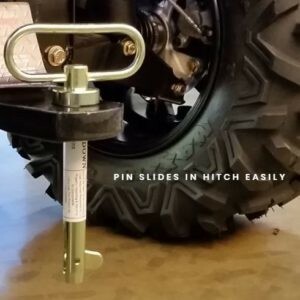 Please see the pads listed below: Contour Western Ranch Roundskirt pad - 26" Pro-Tech/Pro-Tech Premium - 28.5" Diamond Line Endurance pad - 29" Endurance & Drop Rigging Pad - 27"
A Hi Mary, thanks for your question! There is a pocket under the Ultra ThinLine panels for adding front shims, bridging shims, rear shims and our new full length Booster shim.